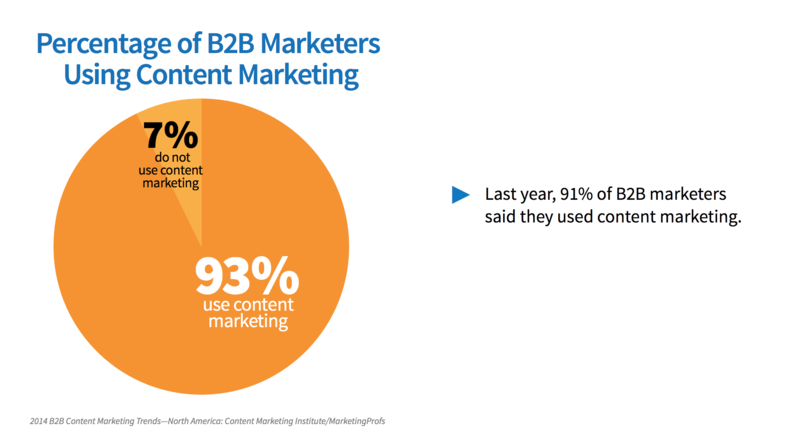 If you’re reading this, you’re probably already sold on the power of content marketing for B2B. However, just because you understand that content marketing is a reliable and affordable path to success, your boss or other decision maker may not be aware of its potential or may be resistant to changing their current course. B2B organizations tend to be more entrenched and static when it comes to adopting new marketing techniques and this is especially true when these techniques are as radically different from the norm as content marketing. Although this may be the case, the mounting evidence for content marketing’s effectiveness for B2B is iron-clad. If you don’t convince the higher ups in your organization to buy-in, no worthwhile initiative can get off the ground and you might get left behind as your competitors embrace content. This article will provide you facts to back up your argument as well as strategies for how to approach the discussion and how to frame your request. After all, even the best B2B content marketing knowledge is worthless if you can’t get your organization to OK your efforts. B2B organizations may lean more towards the conservative side when it comes to new business practices, but they also tend to respond favorably to cold hard data. This is especially true the higher up within a typical B2B company you go. Since it is your job to champion content marketing to the decision-makers in your industry, coming armed with information will be a big help towards making your case. Luckily for you, there are plenty of cold hard facts to support the claim that content marketing works for B2B fantastically. In fact, the evidence is almost overwhelming (which for our intents and purposes is exactly what we want). Be as direct and to the point as possible with your information. For example, make it clear to your leadership that 93% of B2B companies utilize content marketing and 42% have called their efforts “very successful” (this is up 16% from just one year earlier), according to the Content Marketing Institute. Cost savings is another good point to stress, since content marketing generates three times as many leads as traditional outbound marketing, but costs 62% less according to Demand Metric. What this data spells out clearly is that B2B companies not only overwhelmingly use content marketing, but that as more begin to master the strategy they are increasingly seeing dramatic success for less cost. Presenting reputable and compelling figures will help give your argument a solid foundation. Even if you do convince management that content marketing is necessary, it might be hard to get them to go all in. The problem though is that content marketing takes time to pay dividends and really only works with a concerted effort. According to IBM business intelligence a dizzying 80% of corporate blogs have five articles or less. This belies the truth that many execs OK content marketing only as a quick test to “see if it works” and fail to understand that content marketing success takes a lot longer than that to pay dividends. In fact, in the beginning of any content marketing effort, the return will be a fraction of what you’d imagine given the effort you put in. This is not a downside of content marketing, it just speaks to the truth that unlike many other forms of marketing, content only grows in an organic trajectory. There are very few overnight content successes. From a standing start, a solid, sustained content effort can take anywhere from 6-12 months to really get going. The only way to guarantee even this relatively modest growth is to maintain a sustained content marketing rhythm. Rand Fishkin, the CEO of Moz perfectly explains the friction and inertia of getting the content ball rolling in an episode of his Whiteboard Friday series. In any organization, the pain associated with this gap is going to cause people to question the effort; however, in a bottom-line oriented sector like B2B, the pressure to show results will be even greater. As you make the case for embracing content marketing, be sure to make it clear that the returns will be delayed and that sustained effort will be necessary for these delayed returns to ever come to fruition. If your content effort is contingent on immediate returns for its continuation, you probably won’t make it past five posts and will end up amongst the 80% of corporate blogs that are absolute dead-ends. 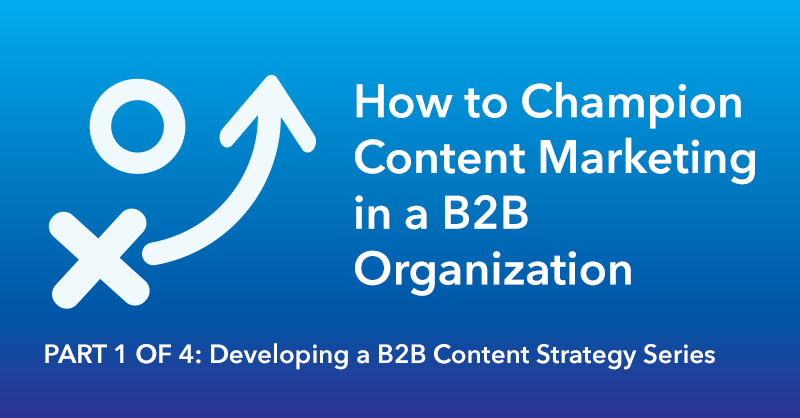 Understanding that content marketing requires full buy-in and a sustained effort for months, you may be wondering how you could ever convince your B2B organization’s leadership to back such an effort. Even if you come in armed with all the facts and figures in the world, you are still asking for a lot. Depending on the size of your organization, implementing a content strategy (and doing it right) might change the dynamics of your entire marketing department. Given this reality the best way to frame your push for content is to make it clear that content marketing can replace, integrate or replicate with many other marketing functions. One of the major perks of embracing a committed content strategy is that doing so encourages a holistic approach to marketing throughout your organization. Building and creating compelling content can help increase trust with your customer base and build awareness of your business, similarly to the efforts of a PR department. Offering premium content in return for information about a customer can contribute to your lead generation and business development efforts. Regularly producing topical content can do wonders for your site’s SEO. Having great, original content to promote can help build your social media following and make it a reliable source of traffic for your company’s website. The content you’re producing can also be used by your sales team to help them land more customers. This list of benefits goes on and on. One thing to make incredibly clear is that good content marketing can come to encompass all of your organization’s current marketing functions. The direction provided by a common purpose will help you make strategic decisions such as which social channels to pursue, how to best extend your content’s reach and can even pave the way for partnerships or business deals by opening the lines of communication via brand awareness. Not only can content marketing utilize and build off of your existing efforts, but incorporating all of these different functions underneath one initiative will help magnify and compound their effectiveness. To further hammer your point home, ask higher-ups which organization’s marketing they love or look up to. Given the previously mentioned statistics on content marketing there is a roughly 90% chance that the organization your boss admires will be making use of content marketing. Do a survey of the competition in your space to gain awareness of impressive B2B content marketing in your industry. This will allow you to readily point to examples of how content marketing is dramatically enhancing their efforts. Depending on what field you are in, some of the most respected publications or sources of information in the industry may be the content marketing efforts of your competitors. Many times, those unfamiliar with “content marketing” might not have a full understanding of what exactly this strategy looks like when it’s done right. They may picture a blog, or a trade newsletter and (understandably) be dismissive of doubling down on efforts that will only produce these isolated assets. However, if you have particularly relevant examples of others in the industry that are using a content marketing strategy to build a cohesive brand that communicates their business offerings in a compelling and appealing way, it will make the purpose of your investment in content much clearer. If leadership is coming up short with examples of marketing campaigns they like, here are a few B2B content marketing success stories from TopRank and B2B Marketing Insider to refer to. Although this article should have hopefully given you a robust arsenal for making the case for content marketing there is one big component that is missing. A plan. Walking in to a meeting with superiors and asking for something unfeasible (or even worse, not having a plan for when you get a “yes”) will seriously hurt your chances of championing content marketing. Even if you can make a case for content marketing as a whole, not coming prepared for the question of how to implement content marketing in your organization will render all the facts and figures in the world useless and cause your argument to likely fall on deaf ears. In my next few articles I will be showing you how to devise the strategy that will take your argument for content marketing from a theoretical proposal to an actionable plan. In next week’s post, I will show you how to best understand and define your brand’s DNA and how to use this organizational introspection to guide and inform a full-fledged B2B content strategy. This is part 1 of 4 in this series. To learn how to develop a B2B content strategy for your organization, review Part 2, Part 3 and Part 4 as well.